The Basque and their militant separatist’s group, ETA, were the only regional groups in Spain that I knew of prior to being in the country and I wondered what it would feel like (if anything) when we crossed the line into their territory. “Separatist’s” and “shepherds” were the only stereotypes that came to mind when I heard the word “Basque”, which left a lot of room for painting a bigger picture. The bombings in Madrid a few weeks ago prompted strong and immediate denials of responsibility by ETA, which had put them in the forefront of the local news and in my mind. ETA has a decades-long history of killing for its cause and had been thwarted in a planned attack on Madrid just days before Al Qaeda struck in March. But our guide book was reassuring: in general ETA has favored police officers over tourists for its targets. And we nervously laughed as we wondered if there was an honor among terrorists that would prevent Al Qaeda from staging an event on ETA’s turf, creating a little “Al Qaeda Free Zone” for us while in the region. Coming down off the mesa in northern Spain. As we pedaled across the political boundary into our first Basque province, the instantly appearing bilingual signage was the first clue of the change. We struggled to categorize it, but Basque definitely doesn’t look anything like Spanish—it looked like more of a blend between Dutch and a Slavic language to our eye. Oh, and our poor ears were so confused by the sound of it. As we overheard a conversation our brains flashed up: “French?” “No, a German dialect?” “Maybe Dutch?” None of them fit. I later read that Basque is one of the oldest languages in the world and it is the oldest form of a pre-Indo-European language still in use in Europe (perhaps 4,000-5,000 years old). We didn’t hear enough of it to be confident that we’ll even recognize it in the future, but it certainly is a scramble of sounds to us. And though they do use the Latin alphabet, the local script on some business signage is sometimes only partially decipherable because of their traditional embellishments. Our hearts sank with the appearance of the baffling Basque language: we’d made such great progress with our traveler’s Spanish. We had a satisfying ability to carry on simple little dialogues, so it was disappointing to once again feel linguistically isolated, especially without changing countries. Aside from the confusing language on the signboards, the only other visible signal that we were in the Basque provinces was the hats on the men. The older men often sported oversized, navy blue or black berets that were always plain and unornamented and worn just a little to one side. It’s always hard to be confident about our “read” on how we are being received, but we had a rash of ‘less than welcome’ feelings right away in Basque-land. I sensed disgust rather than indifference when I asked for an English newspaper from the man at the newsstand in the large port city of Bilbao. Elsewhere in Spain, I had been greeted with apologies when they didn’t have an English paper in stock and this guy, who actually had the newspaper, seemed distained to sell it to me. Two days later, we had to go into a bakery twice to be sold bread and still don’t understand what the problem was the first time around. In these first couple of days in Basque Country, we just didn’t have the same feeling that the welcome mat is out as we had elsewhere in Spain. But just after that opinion was being formed, a man about our age approached us while we were at an intersection, invited us to his home and showed us a scenic trail we could ride to avoid traffic. But even though we didn’t feel especially welcome as English-speakers in the Basque region, a makeshift civil conflict memorial from the 1960’s on the coastal road was written in 3 languages, including English. And we spotted separatist’s graffiti that was also multi-lingual, including English. They may not welcome us, but apparently some of their numbers want us to be aware of their cause. I know that the displeasure with the US in luring Spain into the Iraq war has been an even more sensitive point since the Madrid bombings last month, but my guess is that the coolness towards us in Basque Country runs deeper than that. And I wonder if it is because we are outsiders and that it actually has little to do with our specific nationality. And there is clearly some amount of animosity that runs between the Basque province Alava where we entered the region and the adjacent, non-Basque province of Castilla-Leon. We had been riding north towards the Atlantic coast in Alava for several hours and suddenly the pavement turned horrific. Map Man had, as usual, intentionally selected a back road for us, but the rough, pot-holed surface was like none we had seen in Spain. 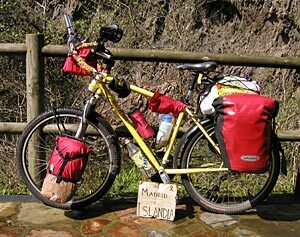 Bill looked at the map and we had indeed crossed back into Castilla-Leon when the pavement turned to trash. The map revealed that this stretch of road was through an odd-shaped strip of Castilla-Leon’s territory that jutted into Alava and that would primarily be traversed by people going between the 2 parts of Alava, and not routinely be used by people in Castilla-Leon. The moment we crossed the line back into Alava, the road widened and the glassy-smooth surface reappeared. Even as outsiders, the pissiness of the regional politics that this represented was unmistakable and we chided Castilla-Leon out loud for its pettiness. As we traveled on, I finally realized that those Rorschach-like ink blots on white banners were probably separatist’s flags. They aren’t all done exactly the same, but I finally got a close enough look to see that the black blob was a map likely depicting the coveted lands in Spain and France to be joined. 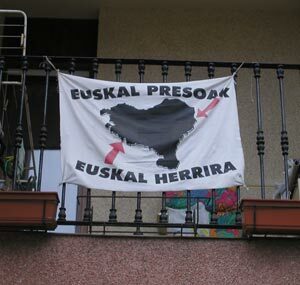 The red Basque flag was displayed much more often than this presumed separatist flag which usually was only hung from apartment windows. As in Galicia on the western coast of Spain, in the Basque provinces we encountered altered road signs. Sometimes the bilingual (Castilian and the local language) are modified to obliterate the Castilian, leaving only the local language spellings. Or sometimes the folks with the spray paint cans ‘correct’ the Castilian spelling of a town name. It isn’t usually a problem for us in finding our way but it is an unfortunate reminder of the conflicts in the region. Outdoor tile rendition of Picasso's "Guernica". How odd that these people that have clearly enjoyed their suffering from not having a separate country have so isolated themselves that the average tourist won’t even be able to honor their history. Guernica (as it was called at the time) was bombed by Hitler at the request of Franco during the Spanish Civil War in 1937. Hitler wasn’t even at war with Europe yet but took Franco’s request as an opportunity to test out his new war toys. It was one of those especially horrific bombings as the primary target was the market area of the town on market day and the military targets in town weren’t hit. It was this civilian atrocity that prompted Picasso to create his powerful mural. I was heartbroken to read that there was a museum in town that we could have visited during the day that addressed both the bombing and the Picasso mural it spawned. I put down my guide book and despite it being 8 pm on Saturday night, I decided to go looking for it to ease my frustration. I knew the museum would be closed but didn’t care. But much to my amazement, I couldn’t even find it. A young woman at another museum that was closing late that night helped me out and I was astounded to discover that we had walked past the nearby museum several times during the day. Yup, we walked right by it but the Basque signage didn’t make it evident that it was a museum, even to museum junkies like us. We delayed our departure the next day on Easter Sunday morning just in case the museum was open and amazingly, it was. It was Basque Day and those loyalties apparently won out over Easter Sunday in deciding to open the museum. Though hardly grand, I was very pleased to have the opportunity to see the museum. But I am still mystified at this “shoot yourself in the foot” mentality that seems to exist in Basque Country—this bias towards being so exclusive and separate as to set themselves up to be overlooked. I also thought it odd that in the very recent remodel of what they described as a peace museum caused them to drop the English previously used on the displays. It was a curious decision given that the stated goal of the museum was to reach out and stimulate discussions about peace—I would have thought they would want to speak to a broader audience, not a narrower one. As we prepared to head-out after snapping the photo of the tile rendition of Picasso’s mural in Gernika, I was shocked to hear myself say out loud to Bill not to take a photo of another subject as “We might get shot.” It was of course a joke, but it revealed the willingness for violence that we were beginning to understand is a part of this region. In other areas we also have our jokes about rejection by the locals. Experiences in Germany the first year in trying to get an extended visa has left us with the ongoing giggle about “Go Home.” In Italy, it was the experiences at the post office that tagged that country with “It’s not possible.” And the French clearly communicate to us that we are just generally unworthy. But only in Basque Country has the spontaneous tag phrase been violent: “Do that and we’ll get shot.” It’s not a real fear but it certainly reveals how my subconscious is processing the experience. The images in our minds from the last 24 hours of immersion in BBC news while in Gernika made for unflattering comparisons with the Basque. Here on Basque Day (or whatever this celebratory day is called—we of course haven’t seen it in English) defiant Basque men invaded our overnight town of Gernika with a small caravan of cars blasting their horns and flying separatist flags as they repeatedly crisscrossed the city. Normally I would cover my ears to muffle the deafening sound but again the thought “…might get shot” darted through my mind. No, I don’t really think there is ‘an enforcer’ standing on every corner ready to annihilate the unsympathetic, yet the willingness to use violence to make their point is hard to forget and compels me to be very cautious about not offending. As they were busy intruding on the peace and quiet of the public spaces, I remembered seeing on BBC that the Pope would soon be giving his Easter speech, which was expected to be heavy on peace and the rejection of terrorism and violence and thought it an interesting contrast to the nationalistic demonstrations going on around us. The BBC had just immersed us in the horrors of Rwanda as they revisited varying aspects of the massacre 10 years ago in a week-long special. We had heard more than we wanted to know about the cruelty and hatred that had lead to the killing of nearly a million people in 100 days--5 times the rate of Hitler’s genocide operations. I couldn’t help but think of the willingness of the Basque separatists to kill their own: to kill and torture their neighbors and wondered how they see the spirit of what they do as different from what went on in Rwanda (of course, there is no comparison in numbers as ETA has killed under 1,000 people). The BBC also flooded us by revisiting the recent horrors in Kosovo and the rapidly spiraling-downward situation in Iraq. I wondered how the Basque’s could watch those situations and still wage their own reign terror with pride. On our way out the door in the morning, the BBC did mention that there was suspicion that ETA would offer a cease fire soon. The surmise was that outgoing Prime Minister Aznar’s increased arrests of ETA members was having an effect and that the March Madrid bombing was the last straw. ETA’s last successful bombing had only managed to kill 1 child where as Al Qaeda had killed 200 in Madrid, making ETA look ineffectual in the killing business. And, as we had imagined, the outrage at the Madrid bombing had given terrorist tactics a bad name in Spain. We had wondered how ETA would be affected by the Madrid events as they were so very quick and adamant in denying responsibility. It was odd to think that by their insistent denials that they must view their brand of terrorism as “OK” and Al Qaeda’s as “not OK”. I must say that the subtlies of the distinction were lost on us. 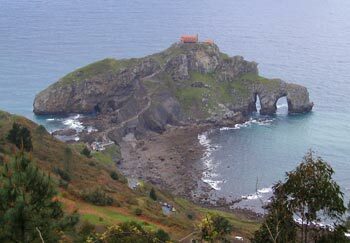 Coastal scenery in northern Spain. When our lovely secondary road veered inland and took us through the middle of a small Basque village at the tail end of the Basque Day celebration, we felt decidedly unwelcome. The separatist banners were boldly displayed across the central building and the road lined with parked cars made it clear that folks had driven from neighboring communities for the event. People were milling in the street with half-filled glasses in hand. Blank stares greeted us—no smiles, nods or curious looks. Bill was prompted to keep on riding but I stopped just past the center of the action to see if the reception would change. I sipped from my water bottle and looked around but “Best to keep moving” was definitely the message--and best not to take the photo I longed to have. Bill looped back to where I was and then we rode on out to the edge of town to take our break where we felt free of the tension of being intruders. I kept wondering if this unpleasant affect of the Basque was a long standing tradition or a bit of the clannishness of the French that had seeped across the border or perhaps the product of fostering separatist-fueled hatred for so many decades. Whatever its source, it was sad to see and feel. Barb's bike and Iceland sign. The cold reception when we rode through this village made me extremely glad I had just ditched my “de Madrid a Islandia” (“from Madrid to Iceland”) cardboard sign that I attached to the back of my bike and replaced it with “A Islandia” (“to Iceland) instead. We never advertise that we are Americans as the US is way-too unpopular abroad these days, especially with our current and threatened wars. But, for the first time in our travels, we had thought we had 2 innocuous-enough travel points on our itinerary that we could display them. Spain sat out both world wars and Iceland just hasn’t been much of a player in the world scene, so we thought our little sign wouldn’t offend anyone. But the lack of black ribbons as a sign of support for Madrid after the bombings made it clear that “Madrid” probably bordered on being ‘fighting words’ in Basque Country so I remade my sign. In prior years, we were traveling in so many countries where the hatred of their neighbors flowed so freely that we kept our itinerary to ourselves. But our little sign had achieved its objectives over the last few weeks, which was to satisfy some onlooker-curiosity and garner us a few sidewalk conversations with the friendly Spaniards. I had even drawn a black ribbon as the symbol of sympathy for the Madrid bombings. But in Basque Country, avoiding advertising our citizenship didn’t seem like enough and that avoiding mentioning we traveled from Madrid now seemed wise. And the black ribbon definitely wasn’t a good idea there. Sad that even as passersby’s, the hostility of the Basque people had nudged us too to contract while in their midst. What a shame to see that the Basque people were conjuring up the same squirmy feelings we’ve only experienced in eastern Central Europe. It wasn’t long and Bill was recalling a similar skiddishness we felt when rolling through a Roma (gypsy) shanty town in Slovakia and I was struggling to find the right comparison with the contracted, anxiousness we felt in former communist countries like the Czech Republic. Neither of our experiences with the Basque were so extreme, but what a commentary that those unflattering comparisons were triggered by our contact with the Basque. The same day that we felt like we’d “best keep moving” when we rolled into the Basque celebration, I was reminded of how quickly the foundations of stereotypes are formed. When the people in 2 different cars applauded our efforts as we slowly pedaled up a very steep hill, my immediate comment to Bill was: “I bet they aren’t Basque.” We’d hardly seen any of the Basque smile and so literally applauding us seemed decidedly Spanish and not consistent with the Basque reserve. Unfortunately, their newer car license plates didn’t reveal their home region as the older plates do, so we don’t know if they were residents of the Basque provinces or not. About the same time I began wondering if we should abandon saying “Hola!” as a greeting. It is definitely Castilian and not Basque and perhaps it was a put-off. It wasn’t helping to break the ice as using a local greeting usually did. I wondered if “Hello,” which seems to be universally understood even though it’s not universally used, would be relatively more neutral. Of course, the Basque greeting would be better but I realized so few of those had been directed at us that I couldn’t even recognize it. That in itself is odd as it doesn’t usually take us long to be able to at least recognize a local greeting even if we can’t replicate it. Our guide book lists the Basque “hello” word but doesn’t give enough phonetic help to make me bold in such hostile waters. And as the day progressed, the “Don’t do that or you might get shot” ‘joke’ kept cropping up. Its not that the Basque coolness is horrible, it’s just horrible in comparison to the openness and friendliness of the Spanish. If we had entered Basque Country from France where we routinely get the cold shoulder, it wouldn’t have been as startling as coming from elsewhere in Spain. Normally keeping a low profile about being from the US is enough armoring, but here it seemed like we were tainted having traveled through Spain. I wondered if there was anyplace it was “OK” to be from when in Basque Country or if all non-Basque are viewed as a threat. Bilbao's titanium clad Guggenheim museum. A part of my mind kept nagging that I really must read more, I must understand what is fueling this violence by the Basque. 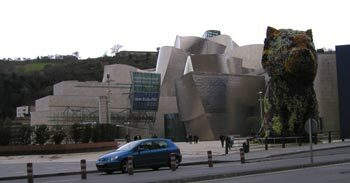 And yet I thought again of the dramatic Guggenheim museum that we had just visited in Bilbao: an ultra modern, titanium-clad building largely funded by the Basque Country government. It is hard to imagine that I would have much sympathy for their cause when they have the regional economic surplus to blow on a museum like that and have the political autonomy to use their own numbering system for the roads, to teach their language in the schools, and to use only their language on business signage. The prosperity and independence that were visible to us within this ethnic minority region of a democratic country didn’t make for the look of an oppressed people. Of course, what we see as tourist’s doesn’t tell the whole story, but their cause looks obsolete from our perspective. I certainly don’t know what the tangible benefits will be to the Basque people if they succeed in getting their own country, but it appears that it will have come at a very high cost. Resorting to the violence of their militia certainly has brought out the ugly side of the people. Compared to the nearby Spaniards, they are cheerless and seem like a contracted and suspicious people. And we saw more security cameras in operation in our Gernika hotel than in all the hotels we’ve staying in for weeks. It’s a grim life they have carved out for themselves with this cause. And I keep feeling a bit used that they make life difficult for us as travelers by not making business signage bilingual with Castilian (or any other language) and yet when they want to make a political statement they make it in several languages, including English. 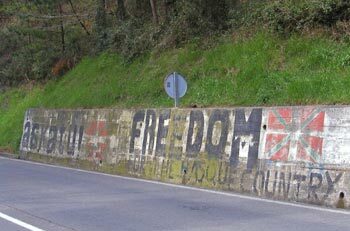 The only outdoor written English we see in Basque Country is when expressing political rage. As the little alienating moments began piling up in our first days in Basque Country, I had more sympathy for the nasty sentiment reflected by the bit of unkempt Castilla-Leon road that juts into the Basque territory. If I was getting so many hits of being unwelcome in a day of just passing through Basque Country as a non-stakeholder tourist, I can imagine the rebuffs that pile up for a non-Basque Spaniard from a neighboring province. I can imagine that Castalia-Leon residents don’t want to do any more than they have to for their hostile neighbors that treat outsiders with such a cold shoulder. I suspect the rebuff is more deeply felt by the Spaniards than by us, especially since they are accustomed to such a high standard of courtesy and welcoming in the rest of their country. The position we were taking in response to the subtle hostility in Basque-land was emphasized later in the day when we struggled to find the 2 hotels that we knew were in our destination town, as we immediately discarded the thought of asking for help. Outside of Basque Country I wouldn’t hesitate to ask in Castilian “Where is the hotel?” but here we decided to zigzag through town again on our own rather than risk the likely rebuff of asking for help from these stern people. Our Basque Day/Easter Sunday experiences were so alienating that I felt compelled to do something to change our experience of the place. Learning to say “Hello” in Basque wasn’t likely to make much difference in how we were received in Basque Country but at least it was a starting point. I employed one of our survival skills for learning basic foreign words and asked the hotel clerk how to pronounce “Kaixo,” “Hello” in Basque. “Ky-show” indeed wasn’t anything I would have figured out on my own. Out on the road however, I still felt at a loss as whether to offer Basque, Castilian or American as they all seemed awkward here. Never before have a felt so befuddled by just trying to say “Hello” in a country. Luckily, we got an unexpected vacation from our shunning in the region with an invitation to tea by a German couple. We were lingering on a stormy, coastal cliff-top viewpoint and Bill noticed a small van with German plates had stopped nearby. We continued ogling the tilted slabs of shoreline rocks as Horst overheard us. He engaged us with his very good English and soon his wife joined in. And it wasn’t long until we were sitting in their small van that was set up for car camping, waiting for the tea water to boil on a free-standing camp burner. It was Horst’s 65th birthday and his wife led us in the traditional “Happy Birthday” song in English as we enjoyed instant tea spiked with a dab of their favorite Austrian rum. We must have spent over an hour chatting, with Horst being intent on speaking English though his wife would revert to German in her frustration with our language. Bill loved the opportunity her German streaks offered him to sharpen his ear. They have visited the US 9 times and clearly, from their cordiality, have made peace with the shortcomings of Americans, which put us at ease. We were fascinated to hear yet another personal story about the life of Germans after the WWII. Horst is the same age as the East German couple that we spent most of a week with last year. Horst was born in 1939 in a region of Germany that is now a part of the Czech Republic. As a 6 year old, he and his family were dumped into the Russian controlled part of East Germany after traveling in a train cattle car from their homeland. At 17, before the wall went up in Germany, he moved into the western part of the country to live with an aunt and uncle. A year later, his parents and sister were no longer able to ‘cross over’ to visit or live. Horst spoke of the few times he was able to visit his parents before they died in their 80’s in East Germany. We heard about their more recent problems after the reunification of East and West Germany and the challenges ahead for Germans with the expansion of the EU. We are always fascinated to hear first hand about the life of Europeans as their history has been unimaginably more turbulent than life in the US for most of us. Horst’s comment in passing was also touching, which was that sometimes when they travel and are in public that they speak English to each other rather than German. He didn’t need to explain, as we are well aware that the Germans are still hated by many in Europe, and not being recognized as a German is to their advantage in some situations. The Germans and French are underwriting the EU and yet it hasn’t engendered much forgiveness of them. We admire the resolve of the Germans to travel despite their poor reception and their willingness to learn about the damage wracked by their country during the world wars. And even since the war in Iraq we are probably better received in general than Germans are (at least for a little while longer). We were sorry to bring our pleasant social interlude with fellow travelers to an end and reluctantly rejoined our waiting bikes. 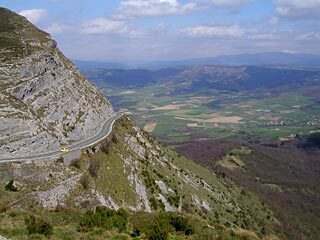 It was a mixed blessing that our route took us onto more traveled roads: it meant more traffic but the brusqueness of the Basque was also more diluted. Having fewer “Basque moments” gave me more time to reflect and I was stunned to realize that we had totally stopping working on our Spanish vocabulary, with which we had had so much fun. 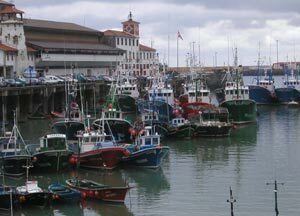 We still used the Spanish when renting rooms, but the compelling urge to withdraw a little from the coolness of the Basque had diminished the playfulness and willingness to be as linguistically bold we had felt elsewhere in Spain. I expected the prominent use of the Basque language to ease our transition as we crossed the border into the French segment of Basque Country but was wrong. We laughed that, predictably, there was no “Welcome to France” sign to mark the border crossing and for our photo album, but the immediate use of the French language highlighted the nationality shift. And it was only moments later that nearly being clipped by a French driver validated the cultural change. The Spaniards drove as though we had a large bubble around us and always gave us lots of room on the road. In contrast, the French drive as though we don’t exist, which is the way many of them relate to us face to face also. And the French drivers quickly re-educated me that I have to fight to retain my right-of-way in traffic or they’ll happily mow me down, even in a small city. Clearly, the overtly aggressive side of the French culture was the dominate influence here, not the covert, withdrawing Basque affect we had seen in Spain. The French jealously control their language to the point of outlawing words like “e-mail” so it’s no wonder that the Basque language is suppressed too. We heard no Basque spoken in the region and only saw the written form on neighborhood street signs and on a few businesses. There were no bilingual road signs as are used in Spain. 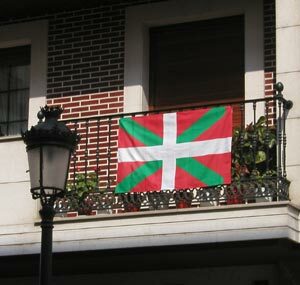 The only Basque flags I saw were palm-sized bumper stickers and souvenir items in the tourist shops. It was odd to see these Basque symbols that in Spain were literally “to die for” reduced to tourist kitsch in the French shops. And there certainly weren’t any separatist flags hanging from apartment windows. It would be interesting to know if the French Basque’s lack the enthusiasm of their Spanish counterparts for a separate country or are not given the same freedom of public expression. Whatever the politics of the situation, it was clear that we were now in France and no longer in a Basque stronghold. It was ironic that our quickly-formed stereotypic experience of the cool, aloof Spanish Basque people was broken only after arriving in France. It was there that 2 young Basque men from Spain stopped to chat with us on the road. They were on one of their many long-weekend bike tours and couldn’t have been more friendly and charming. We had fun talking with them and were pleased to at last have an more normal experience with some Basque, even though it was with folks “on the road” instead of in their home setting. After a typically circuitous route, we are now on the western coast of France in Brittany. We’ve delayed our visit to Normandy to avoid the chaos of overlapping with George Bush during the 60th anniversary celebration of the invasion on June 6th. We expect to be in England in the first week in July.